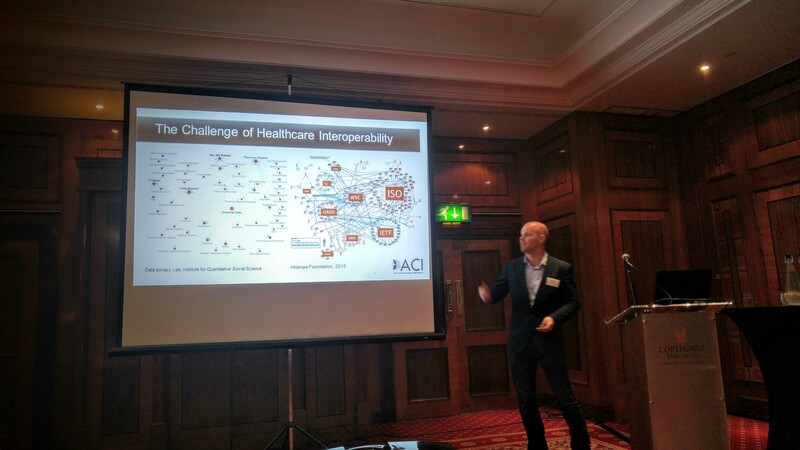 On 26th and 27th of October in London, I had a pleasure to participate in the ACI’s Digital Marketing in Healthcare Conference. This relatively small event has gathered an unusual, interesting set of speakers and guests coming not only from the pharmaceutical industry and its vendors. Tom Macfarlane (Accenture) speaks at ACI Digital Marketing in Healthcare Conference, London 2016. Of course, this does not mean that presentations were not valuable. Due to Chiltern Railway’s failure I have not been able to hear highly appreciated presentation of NHS’ Head Of Digital Primary Care Development, Tracy Grainer [@tracey_grainger]. I have enjoyed a comprehensive review of digital space in healthcare by Tom Macfarlane [@tomwmacfarlane], Director and Lead of IDMP offering in Accenture Life Sciences. Tom has touched on all critical points in the current discussions on digital marketing in healthcare. Patient engagement, regulatory environment, technological advancements of EHR and IOT/QS. Very dense, highly engaging presentation. A disrupting future personalised by Dr Tobias D. Gantner, CEO and Founder of HealthCare Futurist who genuinely hacks the healthcare industry to make the future happen now. Tobias gave us some feel of Steve Jobs reality distortion with his ideas such as a wifi connected baby pacifier filled with temperature and pressure sensors and enabled with paracetamol ejection device. A traditional, sales-driven approach of Dr Graham Leask, a pharma executive with 20 years of experience in pharmaceutical sales and marketing, now a marketing strategy lecturer at Aston University in Birmingham. Well, experienced does not mean being backwards or conservative. Dr Leask has actually preached the same multichannel, measurable, digitally enabled approach to marketing as offered by the author of this text. The same story has been told over again by Anders Tullgren, President of Intercontinental Markets in BMS and Carmen Chavarri running Digital for Neuroscience franchise of Shire in Spain. Uri Goren from Teva has opened an interesting topic of using digital channels to crowdsource healthcare solutions with patient advocacy groups. I have left ACI’s Digital Marketing in Healthcare Conference feeling that the industry as a whole has finally embraced digital channels. Whether it is Chloe Wates‘ selection of speakers or just a reality of today? What are your thoughts? I agree, coming from a vendor perspective it certainly helped me shape my thinking as I move deeper into the pharmaceutical industry. At the same time it made me realise some challenges on how to ensure mobility is seen as a vehicle to improve patient healthcare, make HCP more efficient and ease the burden on the NHS. Legacy software and stubborn management are two immediate barriers to overcome as well as compliance and regulation of course. The solution is to build proof of concepts that help to validate innovation and prove new solutions work. This reduces the amount of investment needed upfront and money wasted in the long run.